How should I store cryopreserved primary cells? Upon receiving your delivery, give your cryopreserved cells the best start by immediately transferring them from the dry ice shipping container to a liquid nitrogen storage tank. It rarely happens, but in the unlikely event that little or no dry ice is left in the package upon receipt, see if you can thaw and use the cells immediately. Always keep in mind that storing the cells at -80°C can cause irreversible damage to them. I’ve heard that properly thawing cryopreserved cells is an essential step in the culturing process. Could you give me some pointers? Start by thawing the cryovial of cells in a 37°C water bath. It usually takes about 1-2 minutes. 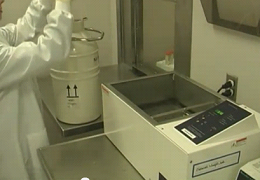 Take the cryovial out of the water bath when there are still some small ice crystals remaining in the vial. Remember that prolonged exposure to heat will damage the cells, causing them not to plate. Don’t spin down the cells to remove DMSO after thawing because the centrifugation process can cause even more cell damage than DMSO. Once the cells are plated in the recommended amount of media, the DMSO should be sufficiently diluted to prevent any immediate harm to the cells. Don’t thaw the cells on the bench top at room temperature. If you have the same question regarding hepatocytes, take a look at one of our previous posts: 6 tips for thawing hepatocytes. How often should I change the media? After thawing and plating the cryopreserved cells, you should do the first medium change after 24 hours or overnight, so that both residual DMSO and any dead cells are removed. After that, you should change the medium every 48 hours until the cells are ready to be passaged. What does “population doubling” & “passages” mean? Both terms are related to cell growth. I prefer to use the term “population doubling” instead of “passage” for describing the growth potential of the cells. A population doubling is a two-fold increase in the total number of cells in culture. A passage is the propagation of a cell population by subculturing from one vessel, to 2 to 4 vessels. Because different researchers use different split ratios when they subculture, it’s difficult to predict how many passages can be obtained with a particular primary cell, but population doublings are given on the lot-specific datasheets provided with your primary cells. 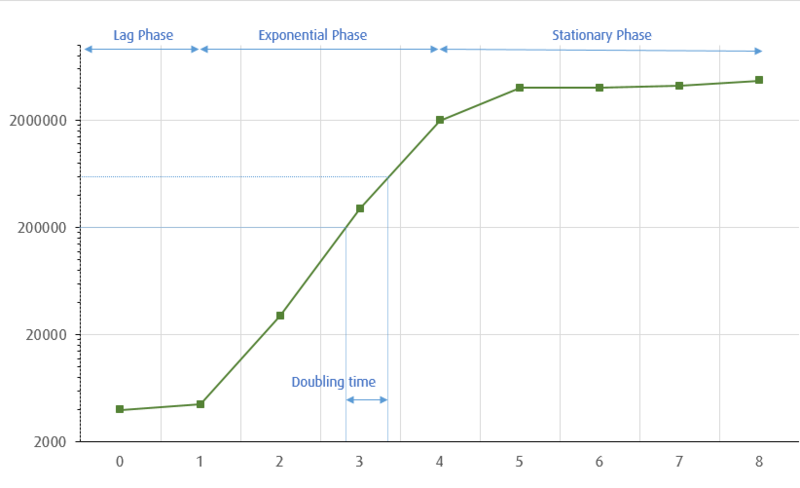 Population doublings are calculated during the exponential culture phase, not during the lag phase. This is a mistake often made. How do I calculate the number of flasks or plates I should set up for culturing the cells? When subculturing primary cells, what are the most important things to keep in mind? All reagents should be at room temperature. Don’t warm any reagents to 37 °C! Don’t over-trypsinize, get it right by strictly following the trypsinization instructions in the protocol provided with the cells. Watch cells under the microscope during the entire trypsinization process. Don’t trypsinize in an incubator! Most of the commercial trypsin protocols are made for cell lines, so you really don’t want to follow these general trypsin recommendations for your primary cells! Any remaining doubts or questions about primary cells and how to culture them? The specialists at tebu-bio have a lot of lab experience and are in contact with researchers on a daily basis. Get in touch via the comments form below with any questions!